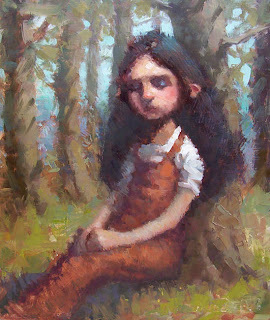 It's strange; I often sketch without reference when working digitally, but I rarely do that with oil paint. Why not? So last week I decided to just sit down at the easel and push around the paint, with no pre-planning, to see what would come of it. And it was fun! I love the feeling in this! Very beautiful illustration. And oil, wow. I haven't experimented that much with it yet but, I am certainly planning to, soon. wow - your stuff just blew me off my seat! Glad i found this, awesome work! Really like it. It has a real old style childrens illustration feel to it. You should totally do more of this! Really nice! Wow.. great recent illustrations my friend!.. I love your "Recent Quick Sketch".. so now in oil!.. Man, this is fantastic, this style would be great for a childrens book . . . . Marco, you're killing it! Awesome work my friend! nice stuff marco, always awesome! I love it that you just sat down at the easel and went at it. Very inspiring. Great job! She is wonderful! Funny, but I really like her ear best of all. I like your work.